Front of The Big House and Studio taken in the fall, 2018. 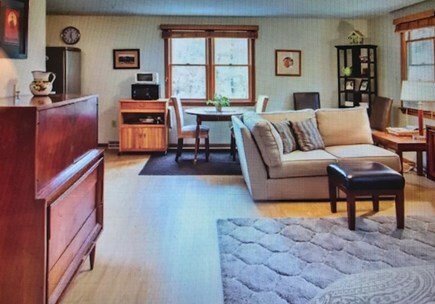 Oversized living room will provide a comfortable place for all. Living room with view toward the French Doors and recliners. Dining area has rom for 12 with leaves in the table. 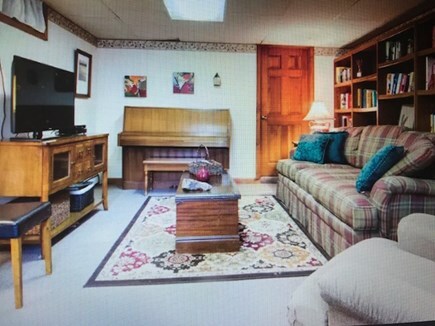 Entry family room with two twin sleepers and comfortable space. The Game Room. Play games, watch a video or host talent night!! 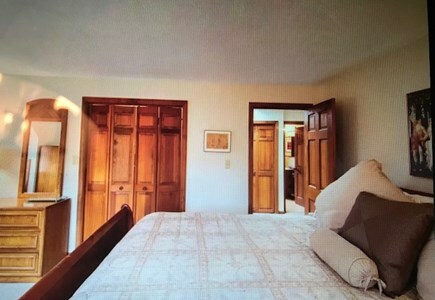 Queen size bedroom on the first floor and ensuite bathroom. 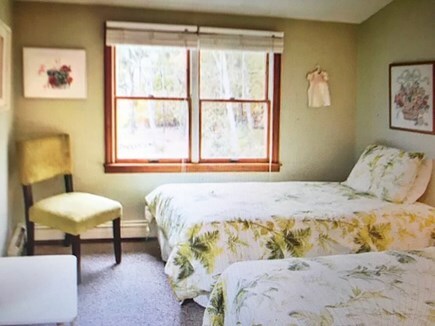 Two twin bedroom with tropical bedspreads and unique wall decor. King bedroom on the second floor with bathroom across the hall. 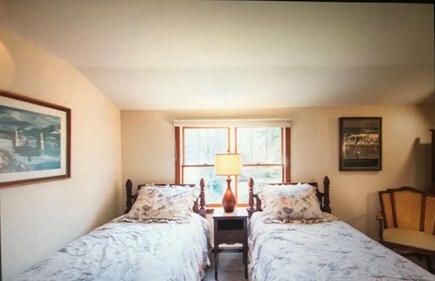 Two twin beds in upstairs bedroom with lovely decor. Kingsize bed in upstairs bedroom with nautical blue theme. Huge deck spans the back of the house connecting to the studio. Studio with kingbed (in foreground), mini kitchen and bath. 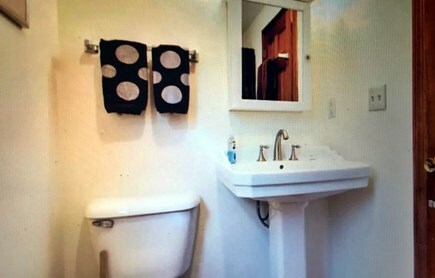 Studio bath with pedestal sink and 4 ft. stall shower. View from the badminton court toward the back of the house. Laundry area is on the second floor behind bi-fold doors. Beds: 3 kings, 1 queen, 4 twins, Two twin sofa beds can be used. Beach: 1.5 miles to First Encounter Beach on the bay. The Big House is the perfect vacation house for large family groups vacationing together. 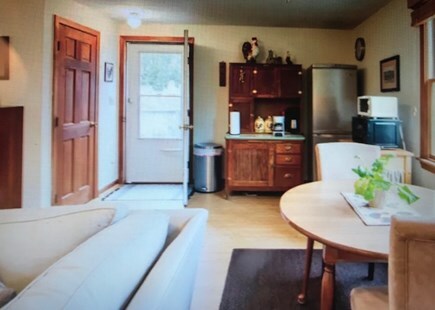 This impeccably clean property includes the main house with a huge living room, open kitchen/dining room, 5 bedrooms (2 with king size beds, one with a queen and two with 2 twin beds each), 2 full baths, a den, a game room AND a separate studio over the garage with another king size bed, bath and even a mini kitchen. 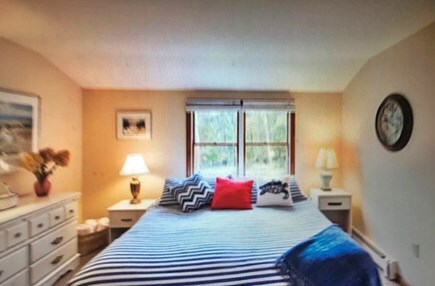 All linens are included in this rental; beds are made prior to your arrival with freshly laundered linens, fluffy towels are hung (or in baskets) and even beach towels are there for your use. 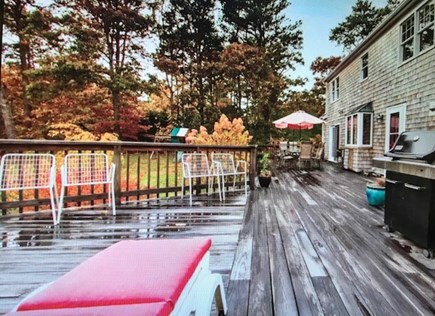 The over-sized deck has 3 chaise lounges, two tables, 12 chairs, and a gas grill for outdoor entertaining. This beautifully landscaped 3/4 acre property includes a swing set for the little ones, badminton, basketball, croquet and tennis (at the association courts) for the older kids and adults. Easy access to the bike trail (at the dead-end) will be enjoyed when you use your own bikes or those stored in the garage. There are three floors of living area in the main house so you can all be together or find a quiet space for your own private time. Beds include 3 kings, 1 queen, 4 twins. All rooms are air-conditioned, and there is a large flat screen television in the living room, game room as well as in the studio. 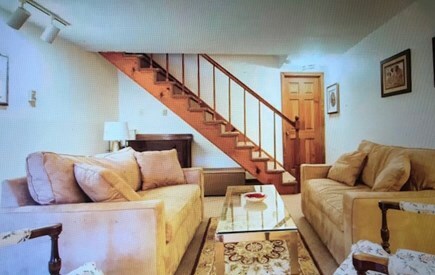 If you really need to conduct business while on vacation, this property has Wi-Fi accessibility from all rooms, including the studio over the garage. There are movies for the DVD player, a CD collection for the stereo, a Wii for games or you can play the piano and enjoy your own music. Access to the Cape Cod Rail Trail is at the end of the dead-end road. .8 miles to Boat Meadow Beach and 1.5 miles to First Encounter Beach (bay beaches). Ocean beaches are about 2 miles - Coast Guard or Nauset Light Beach. 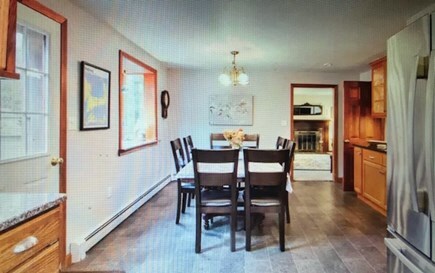 This home is lovingly maintained by the owner so you can enjoy a Cape Cod vacation even more knowing that it will be as pictured. This will be a vacation better than you could have hoped for or imagined. Book your week now, before the 1st of the year, and save 15% on the rental tax that will start January 1, 2019. Nearest beach: 1.5 miles to First Encounter Beach on the bay. Children's playground area in the back yard. Safe from traffic. Additional pricing info: Cleaning fee is $375. No charge for linens included; bed linens, bath and beach towels. State and local taxes of 12.45% will apply. This property is not handicap accessibile. Great location with plenty of space! Very clean and comfortable. Liz was very responsive and easy to work with. This place was perfect for a family vacation. There aren't many places where you can get 3 king beds plus more! We had an excellent time with the entire family. We loved being so close to the beach and great pond. I wouldn't hesitate to stay again in the future. We enjoyed our stay here with several family members - all loved the ocean & Great Pond. Your home has plenty of space for activities as well as just relaxing together. We enjoyed dinners on the deck as well as around the kitchen table. The access to the rail trail at the end of Ireland Way was a definite plus as I was able to take anearly morning ride several days. This is a perfect spot for our family to gather and enjoy vacation time together. This was our third year renting this property. We enjoyed lots of fun at First Encounter, Arnold's, mini-golf & the swings right in the back yard. Our two week stay here was everything I'd hoped for! Over the course of our rental, I had a total of 22 family members come and visit (not at the same time, of course) and all had a wonderful time. This home had something for everyone - from the 2 year old twins to my 76 year old sister. The children loved the beach, the toys, the swings and all the space to run around. For the 30 somethings, the huge deck and comfortable subterranean playroom provided perfect places to while away the nights, with favorite beers and ales, as cousins from California and Kansas re-connected. For my sister, the cook, the kitchen offered every type of cooking and baking utensil she wanted. And for me, the deck and kitchen table served as my favorite place to sit and chat over coffee (or wine) with adult children and grandchildren, and to get to know the newest and youngest members of the family. We rented this home for three weeks during the height of the summer, the first three weeks of August (2017). Our vacation was fantastic, and the house was wonderful. We had older kids and adults so the location was perfect...easy access to the bike path, a short walk to a beautiful pond, or a longer walk or five minute bike ride to the bay beach were all done multiple times. You can also bike to ocean beaches or get a town sticker if you want to drive and leave your car. The house is close to the Orleans rotary, or you can avoid Route 6 and pick up stuff at the Eastham Superette by taking backroads. Just across Route 6 is the Saltmarsh visitor center and Coast Guard beach, and Provincetown is 30-40 minutes unless there is major traffic. You can also bring your tennis racket as there is a community court a short walk away. If you have lots of cars, pull some up near the basketball court and park cars in the driveway close to the wall to leave as much room as possible when backing out. The driveway can get narrow, so make sure guests are warned about the lights on the side, the utility boxes at the end of the driveway, and the traffic in the development when backing out. The flowers off the deck are lovely, with lots of bird activity in the back yard at all times, including the occasional hawk or coyote. Don't miss a visit to the Audubon sanctuary, a close drive to Wellfleet (all back roads if necessary), for their nature walks and boat rides out of Orleans. The Wellfleet Drive-in and flea market are also great activities for a change of pace from the beach. We had one problem with an old dishwasher which decided to break down in the middle of our stay. 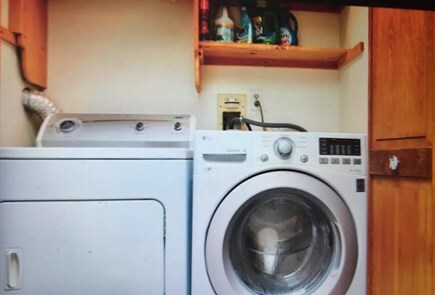 The landlord was very responsive including multiple visits by her handyman, which eventually resulted in a new dishwasher. We would recommend this house for any large family group or those planning on having day visitors and want to host a party. We found the house very well provisioned. The only criticism we heard from one relative was that there was not enough sports channels on TV. While having some top cable channels might have been nice, it was probably better to have the TV mostly off when on this type of vacation! Go for a walk or a bike ride instead of being glued to the TV. Another family vacation in a house and location that's perfect for us! Plenty of time on First Encounter Beach for little ones to dig and splash and, when they leave, Grandma and Papa to read and relax. The bike path is perfect, too, and Rock Harbor's sunsets, baseball in Orleans and great restaurants. Excellent house for our family's annual vacation!! Ideal for multi-generational family vacation. During the past 20 summers, this house has been rented to many wonderful families, several of whom return each year. Knowing that they enjoy their visit to the Cape and making my property what they hoped it would be is very satisfying. Location, location, location! Eastham was the only Cape town to have TWO beaches listed in the top 20 beaches on Cape Cod - First Encounter Beach on the bayside and Coast Guard Beach on the oceanside. The are 1.5 and 2 miles from the house. It's possible to bike to either of them, as well and the bike path is accessible at the dead-end where the house is located. No need to go on any roads for your walk or bike ride. This property has privacy and amenities galore! 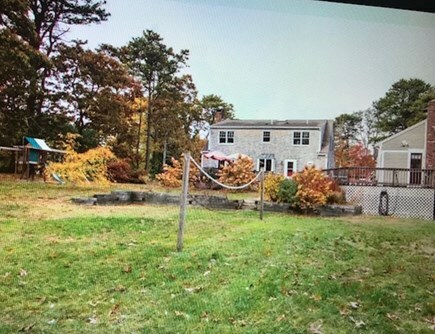 First, there is the huge backyard providing entertainment for all ages; the little ones will love the swing set, older children (and adults) the badminton, croquet or basketball hoop. The best, however, is the expansive deck. Sitting there in the early morning while sipping your coffee, you'll enjoy the chirps of a myriad of birds. There is no street noise!! And later in the day, relaxing with a cocktail as the sun sets is fabulous. This house is located in an upscale private neighborhood. Most houses are occupied by year round homeowners so there's no need to worry about their making too much noise. The outside shower, however, is the treasure here. It is oversized, private and the place to enjoy your after the beach experience. With both hot and cold water you'll love the owner supplied products that are non-toxic and safe for the environment. We are, afterall on a septic system in Eastham. Furnished with extremely comfortable beds, the house and quiet area guarantee's a good night's sleep. Eastham is the best kept secret of Cape Cod. Still unspoiled with development, it is 3 miles wide from bayside to oceanside and there are ponds dotting the land in between. The bike path runs right through the middle so you're never far from enjoying a nice walk or bike ride (there are bikes and helmets for you to use at the house). Monday nights, at Windmill Green, you can enjoy a free concert with great local talents. Should you have a rainy day (hope not) the NEW state of the art library is amazing. Stop for a visit - even if the sun is shining. The National Seashore Visitor's Center is in Eastham!!! There are several attractions there, one not to miss is how the Cape was formed. A definite must from there is the walk out to Coast Guard Beach. A lovely paved path makes this an enjoyable stoll or bike ride even. Fort Hill has two natural wonders; the outer most portion has benches to enjoy the ocean or the superb walk through the marsh with a boardwalk (spring of 2017 renovation). Lots of natural wildlife and quietness. Eastham has the oldest windmill on Cape Cod! If you can return in September (8-10th), celebrate the 40th annual Eastham Windmill Weekend event. All free! includes a Friday night talent show, Saturday sandart at First Encounter Beach, Windmill Green performances and a food truck with a beer garden on Saturday night. The theme this year is ''Sands of Time'' and the parade on Sunday will indicate just how creative the local businesses are.